The Department of Water Resources (DWR) released the final list of critically overdrafted basins, defined as groundwater basins that would suffer significant adverse environmental, social, and economic impacts from the continuation of present water management practices. 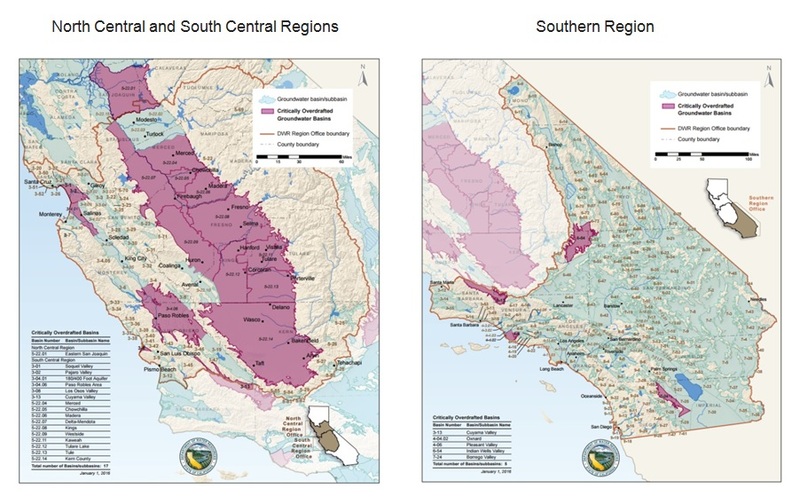 These basins overlay many important agricultural lands in Central Valley and coastal cities. Basic data in several groundwater basins, such as how much water is withdrawn, where it was pumped from, and how much remains in the aquifers, have generally been lacking in California despite the fact that the state pumps nearly one-fifth of all groundwater withdrawn in the U.S. annually. Therefore, DWR’s evaluation was based on a review of available data, reports, and other information used to identify basins with clear evidence of adverse impacts. As the assessment covered 1989 to 2009, conditions of these critically overdrafted basins are expected to worsen during the current drought. Click here to see the North Central and South Central Regions data in more detail. Click here to see the Southern Region data in more detail. State Water Board adopts measurement and reporting regulations for water diverters. The regulations now require annual reporting for all water right holders and claimants, with details of monthly uses. The rules mainly affect riparian and pre-1914 right holders who were previously required to report every three years, and measurement requirements could be avoided if they are deemed not “locally cost effective.” About 70% of these right holders claimed this exemption. New regulations implement Senate Bill 88, which was passed in June 2015. While this is an improvement to water diversion tracking in California, Colorado, some states in Australia, and parts of Spain are already collecting real-time measurements in one centralized accounting platform. El Niño-fueled stormy conditions are expected to make a brief return to Southern California and the southwestern United States. Cities are preparing to capture this rain with examples including Fresno Irrigation District’s groundwater banking projects, LA’s StormCatcher program to retrofit homes with permeable landscaping and ‘smart cisterns’, and Orange County Water District’s aquifer recharge with wastewater. The NOAA’s forecast also predicts wet weather in the next three months, especially for southern regions. The state has a 33% chance of above-average precipitation through April, and temperatures are predicted to be higher than average as well. This could mean more rain, but less snowmelt water to last through the summer months. Scientists at UC Davis are studying the effects of groundwater recharge on almond farms. Some orchards in the Central Valley are being flooded as part of this experiment. It has been estimated that between 3.6 and 5.6 million acres of agricultural fields are suitable for recharge projects. Over-irrigation allows water to infiltrate into aquifers, thus restoring groundwater levels in critically overdrafted basins. However, such activity also poses risks of root damage and contamination of fertilizers and pesticides in groundwater. The DWR and Bureau of Reclamation released a Final 2016 Drought Contingency Plan regarding SWP and CVP water allocation. The plan focuses on project operations and potential modification requests to balance the competing needs and benefits of limited water supplies. Following the release, the Bureau of Reclamation announced a CVP water supply conditions update, which shows lower storage levels for 2016 compared to previous years. On the other hand, the DWR is more optimistic about winter storms and water supply increases, thereby boosting SWP allocation to 15% (from 10% announced in December). A discussion draft for the new California drought relief bill has been released by Senator Dianne Feinstein (D-Calif). Short term provisions include an increase in pumping during winter storms, expanded water transfers, and plans to re-operate the Delta cross-channel gates. Long-term provisions aim at developing water storage (with an emphasis on dams and reservoirs), desalination, and water recycling projects, and providing financial assistance to drought-stricken communities. 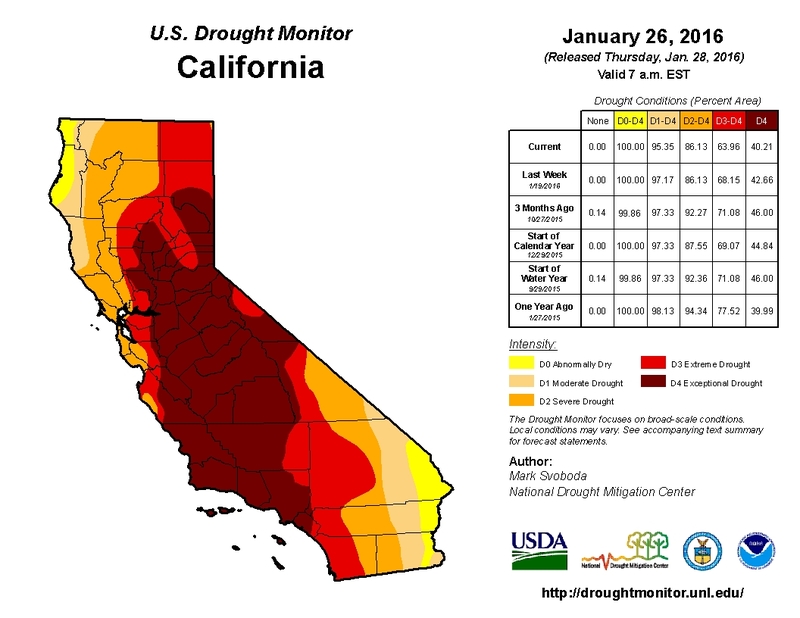 California is undergoing a slow and steady drought recovery. As of January 28, 40.21% of the state is in exceptional drought, an improvement of about 1.5 percentage points from the previous week. 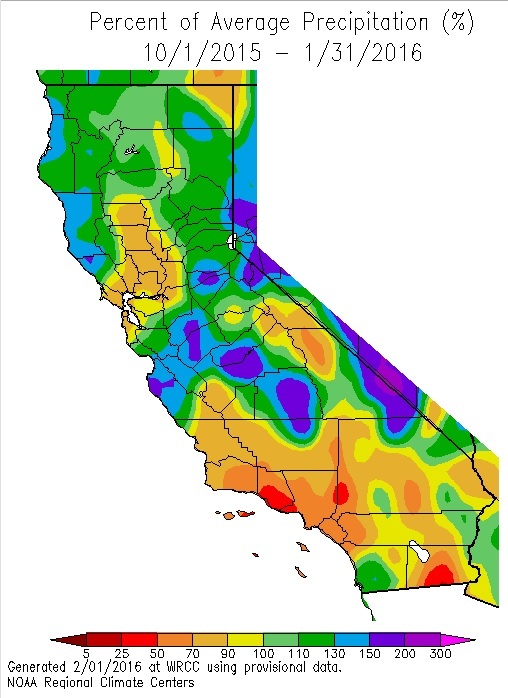 Signs of the modest dent to drought conditions are starting to show, e.g., water-year-to-date precipitation has eliminated most of California’s short-term drought (now only in the west-central coast). A new visualization of drought conditions is now available. 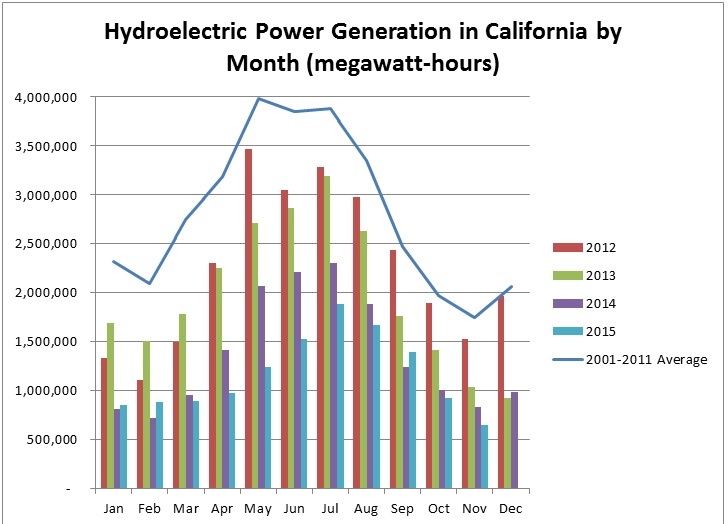 Clear improvements in California are shown between November and December 2015. The weekend storm pushed statewide snow-water equivalent average to 20.2”, or about 116% of the normal average, as of February 1. Snowpack is currently the deepest it has been in five years, since the onset of the drought. Cumulative precipitation since the beginning of the 2016 Water Year (Oct 1) is following the course of the 1997-98 wet years (see Northern Sierra, San Joaquin, and Tulare Basin precipitation index chart). 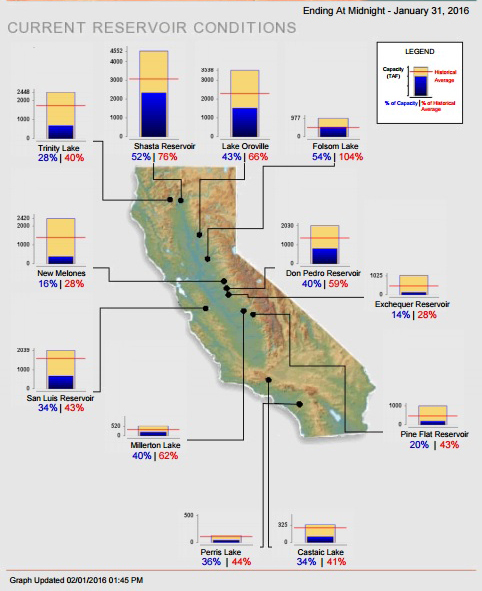 Water levels in California’s major reservoirs (representing 27.3 million acre-feet of storage) have increased to 35% of statewide capacity, compared to 30% two weeks ago. These levels also represent 60% of group historical average, and are at 91% of their level last year. Major reservoirs, such as Lake Oroville, Shasta, and Folsom are now at 66%, 76%, and 104% of historical average, respectively. Hydroelectric power generation in November 2015 was about 650,000 MWh, or 22% lower than in 2014 and 63% lower than the 2001-2011 November average.